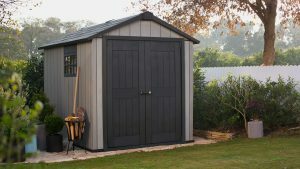 Probably most of us started with a tin shed – they’re cheap and easy to get hold of – every Bunning’s or hardware has a tin shed. However, you pay for what you get and after not long it will start to rust and age which means an eyesore in your backyard….. so you either put up with it, or go looking for something better…. Which could be a timber shed. They look so smart on display at the hardware… but give it a year or so and it will need a new coat of stain. If there isn’t great drainage or sunlight where the shed is situated you could start experiencing mould and rotting. This is where resin sheds step in! Resin sheds withstand problems that tin & timber suffer from – made from UV stabilised polypropylene which resists moisture, insect infestation, rust, rot or fading. You won’t need to recoat or treat like timber and the colour will stay and they don’t dent like tin. Maintenance free and no need for a slab because a floor panel is included with every shed. An investment to enhance your property storage-wise and aesthetically. You can’t go wrong! Check out the range The Outstore offers > Shop Large Sheds. Free freight to most of Australia.